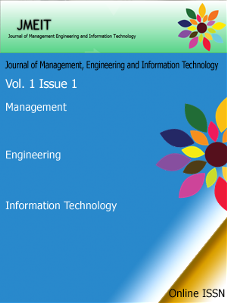 Journal of Management Engineering and Information Technology, invites quality research papers for publication in the upcoming issue. JMEIT is a multidisciplinary journal, it gives equal opportunity for publishing manuscripts from Management Engineering and Information Technology stream. World market is growing at rapid pace and the research work is also required at the same pace, now a days, all universities are having research cell and students and researchers are doing their best to get the new research aspects. to explore more please go through the individual sections the list of topics are just for having the glimpse of the subject matter, other areas may be included but must be relevant. Management is the need of the hour, every sucessful multinational has a strong management. To explore more in this area here is the list of some topics, but as we know it is a growing field we can not limit the topics. In engineering we have many branches like Electrical, Electronics, Mechnical, Chemical, Information Technology, Computer Science etc. It is not quite possible to list all the topics of each branch but few of them are listed below for guidence. suggested but not limited topics.